I don’t have much to say about electric flight, so if you want to learn about propeller selection for your electric powered plane you’ll probably have to ask somebody else. But I can offer some help for those who want to choose the right propeller for a glow powered plane. The first thing you need to understand is the numbers on a propeller. The first number is the diameter, which is easy enough to understand. The second number is the pitch. It’s the distance that a propeller would move forward in one rotation due to the twist of the blade, assuming zero slippage in the air. The two numbers figure into the total load that the propeller places on the engine. There is a “normal” load that an engine can handle. If you load the engine more, it will turn slower, run hot, use more fuel, and deliver less power. On the other hand, inadequate loading will not allow the engine power to be transformed into thrust. Possibly the most well known normal propeller is the 10×6 for a 40 size engine. You can increase the pitch of the propeller if you decrease diameter, or vice versa, while maintaining the same loading on the engine. This is kind of like shifting gears in a car. So in addition to the normal 10×6 your standard 40 engine can use a 9×7, or 11×5, as well as other sizes. Greater pitch makes the plane go faster at the expense of acceleration. Less pitch will produce better acceleration, at the expense of top speed. Most propeller related confusion arises from the fact that the propeller rules are subject to a higher rule about the drag of your airplane. So let’s go back to the standard 40 size plane again. 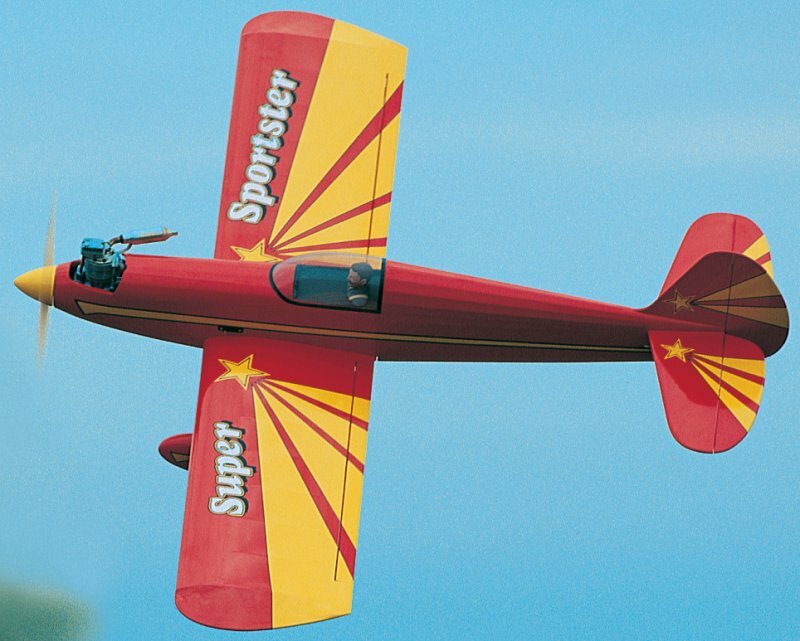 Consider an average sport plane such as the Super Sportster. It has an average amount of drag for its size and can fly at an average speed. 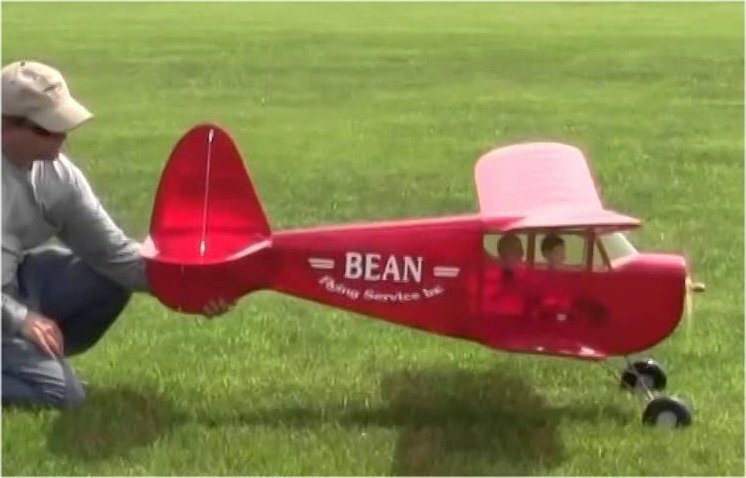 With an average 40 size engine you can use an average 10×6 prop and be happy. But you won’t win a pylon race with a 6 pitch because the prop will go only as far as it’s going to go, according to the pitch of the blade. So the guy with a 9×7 prop will win the race with the same engine. This seems simple enough, but the propeller rules are subordinate to the drag of the airframe. Once the drag equals the total power of the engine it doesn’t matter what prop you put on. The plane just won’t go any faster. You may have heard of a propeller “unloading” in the air. This is where the airspeed is close enough to the theoretical pitch speed that the engine doesn’t have to work so hard to get the air through the prop. Excessive airframe drag causes the engine to keep lugging because it doesn’t have enough power to get it close to theoretical top speed. So, going back to the pylon race I mentioned earlier, the guy with the 9×7 prop will win only if the airplanes are not already operating at their drag-induced speed limit. If they are, then the 9×7 guy needs to reduce drag before his high pitch propeller will do him any good. Or, failing that, he will need to use a more powerful engine. The same principle applies to slow and draggy planes as well. You can fly a really big old-timer with a 40 size engine. Photo I found on the internet. Thanks to whoever posted it. 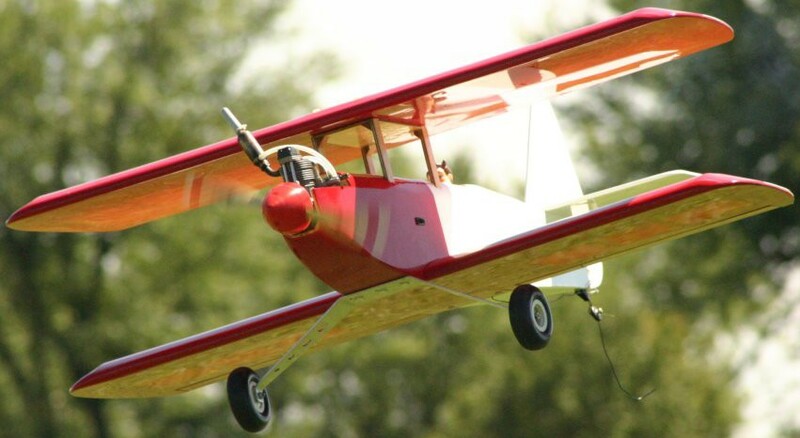 These planes are very light and they have a lot of drag, so they fly best at low speeds. With the appropriate engine, drag will prevent them from going fast, so if you use a high pitch prop it will never be able to unload. In these cases you may want to try 11×5 or 12×4, or even a 12×3 if you can get it. At the other end of the spectrum, you can enhance acceleration by reducing pitch. But the hard limit is your stall speed. You can go only so far before the plane just won’t fly because it doesn’t have enough airspeed. You get a bit of a break because of the exponential nature of aerodynamic drag. Total parasite drag is a function of the square of the airspeed, multiplied by a factor determined by the shape of the airplane (the amount of drag it causes). So you can fit your fast plane with a high pitch prop for speed, without worrying about acceleration because this plane doesn’t have much drag, so acceleration isn’t difficult for it. And you prop your lightweight draggy old timer or biplane for acceleration, because it just doesn’t need to go fast anyway. RC flying presents a lot of mysteries to the uninitiated. If your engine keeps overheating and dying in the air, most folks would assume that your needle is too lean. The obvious explanation is that you’re stupid or the engine is a piece of junk, because try as you might, you just can’t find the optimal needle setting. But maybe you just have too much pitch on your propeller, the airplane is at its drag limit for the available power, and the engine can’t get the plane fast enough to unload the prop. The inability to unload causes the engine to overheat, which requires a rich needle, which uses more fuel and causes a loss of power and unreliable running. I’ve seen a lot of guys in this situation cursing the engine, trying different fuel, replacing glow plugs, etc. Another common theory is that a 40 plane flies better with a 60, and that always solves the problem (and increases weight, turning radius, fuel consumption, etc). If you are in fact suffering from excessive pitch, a propeller swap just might solve all of these problems. Even if it isn’t a panacea it usually helps at least a little bit. #1 Always stay in the load range for your engine, starting with the “normal” prop and increasing one number while decreasing the other. #2 Increase pitch for higher speed, until you reach the hard limit imposed by drag vs. power. Overpitching beyond this point will overload your engine because of inability to unload in the air. Decrease pitch for better acceleration, if you don’t need high speed performance anyway, but stop when you reach the limit where the plane doesn’t have enough head room above stall speed.